Just when it appeared Indian hockey was heading towards better times, the sparring between the Sports Authority of India (SAI) and Hockey India claimed another victim in Terry Walsh, the head coach of the men's hockey team. Facing a one-point deficit with just four games to go, five times world champion Viswanathan Anand is in a now-or-never situation in the World Chess Championship match against Magnus Carlsen. Harbhajan Singh led from the front with an all-round effort as Punjab coasted to a comfortable 29-run win against Gujarat in the pre-quarterfinals of the Vijay Hazare One-day tournament here on Wednesday. Put in to bat, Punjab rode on fine fifties from Amitoze Singh (75), Gurkeerat Singh Mann (72) and Harbhajan (51 off 25 balls) to post a respectable 255 for eight in 50 overs. In reply, the Gujarat batsmen failed to capitalise on their starts as Punjab pace spearhead Sandeep Sharma, who bagged 3 wickets, helped bundle out the Parthiv Patel-led side for 226 in 47.3 overs. Harbahajn chipped in with 2/51. Aaron Finch hit his fifth One-day International century to drive the hosts to a 73-run victory over South Africa in Canberra on Wednesday and a 2-1 lead in the five-match series. Finch put on 118 for the first wicket with David Warner (53) and went on to score 109 on a good Manuka Oval wicket before being bowled by Proteas skipper AB de Villiers. Shane Watson hit a bright 40 but it fell to Steve Smith to haul Australia out of a mid-innings slump with a sparkling unbeaten 73 from 55 balls that gave Australia an imposing total of 329 for five. The semifinals of the World Kabaddi League threw up no surprises as the two teams that were the most consistent throughout the league phase made it to the final of the inaugural edition here today. Chennaiyin FC produced a crushing performance to beat Pune City FC 3-1 as they overtook Atletico de Kolkata to take the top spot in the points table of the Indian Super League here today. Punjab Marshalls’ captain Greg Rusedski was ruled out of the inaugural Champions Tennis League on Thursday. Marshalls’ owner claimed that the British-Canadian suffered a foot injury and his place would be taken by Leander Paes in the legends’ category. Walsh is the fifth foreign hockey coach to leave midway in a decade. Germany's Gerhard Rach, Australian Ric Charlesworth, Spaniard Jose Brasa and Australian Michael Nobbs too left abruptly without completing their tenure. Incidentally, MK Kaushik, under whom India won the gold medal in the 1998 Asian Games after a gap of 32 years, was sacked, too, a few days after the golden feat. Perhaps it's time for both the SAI and Hockey India to introspect why all their coaches fail to complete their tenure. The worst affected in this latest fiasco, as usual, are the players. With the prestigious Champions Trophy around the corner — it starts from December 6 in Bhubaneshwar — Walsh couldn't have left at a worse time. “Players are the biggest losers in this entire episode. We don't know where things went wrong, or what led to Walsh's exit. But one thing is certain, the performance and rebuilding process will take a huge hit,” a senior player of the Indian team told The Tribune. The players are worried about their future, more so about the preparations for the Rio Games as they don't know who would take over in case the Australian doesn't return. “The mood in the camp is really sad. We are disheartened by the unfortunate turn of events. It's a pity that the babudom has claimed another good coach. We all wanted him to stay, the team has shown improvement under him,” said another player on condition of anonymity. The players also don't know who would coach them for the Champions Trophy. However, it has been learnt that High Performance Director Roelant Oltmans would double up as the coach, with Jude Felix supporting him. Some former India players, however, are of the view that such confrontation could be avoided if Hockey India starts recruiting Indians as coaches. “The standard of Indian hockey is going down because of the foreign coaches. They are unaware of the strengths and the weaknesses of the Indian players. Indian coaches can do a much better job,” said Dhanraj Pillay, a former India skipper. Harinder Singh, an Olympian, said Walsh was wrong in demanding financial autonomy and permission to operate from Perth. Nevertheless, it can't be denied that the Indian team had begun to show some improvement under the Australian, the highlights being the gold medal at the Asian Games, a Test series win against world champions Australia and a silver medal at the Commonwealth Games. So it's surprising what provoked Walsh to take the extreme step, especially after it seemed that almost all the issues had been thrashed out in the two marathon meetings the Sports Ministry-appointed committee had with the coach. Apparently, it was HI president Narinder Batra's strong accusation against Walsh over his 'financial misdeeds' with his former employer USA Field Hockey that proved to be the deal-breaker. That Hockey India, which brought Walsh as the head coach after the exit of Nobbs, suddenly became so much disinterested in his continuance is pretty baffling. n	The Sports Authority of India (SAI) executive director Sudhir Setia today said they would send a fresh proposal to Terry Walsh within the next 48 hours for his consideration. Setia said Sports Minister Sarbananda Sonowal, after meeting Walsh on Tuesday, felt the Australian could take Indian hockey forward, and agreed in principle to a majority of his demands. “Walsh will soon receive a new contract from us, with majority of his demands incorporated,” Setia told The Tribune. “He said he would have a look at the contract and get back to us.” Setia, however, ruled out SAI mediating between Walsh and HI. “If the two parties have any differences, they have to sort it out on their own,” he said. With the scores favouring Carlsen 4.5-3.5 after eight games in the 12-game match, Anand is now under serious pressure to score at least one victory. And if that does not happen in the next two games, it might be the end of his hope. Ahead of the ninth game on Thursday, it is not only the match situation which is a worrying factor for Anand but also Carlsen’s preparation. The Indian ace had come up with a fine new idea to win the third game but since then Carlsen seems to have caught the ‘preparation bug’ too. The Norwegian is blitzing out the opening moves in quick time as well as producing new ideas, something that was considered Anand’s forte. Game eight was a typical reminder for Anand that he needs to do far better. Carlsen came up with a new idea in the Queen’s Gambit declined and played pretty quickly with black pieces, while Anand used a lot of time. When the time came for him to think, the danger had already passed and a draw was the likeliest outcome. For Anand, it would be best to go for the kill at the earliest. The time to think about playing with white or black is over and all the Indian ace should be thinking about is to complicate the position as soon as possible. The Indian think-tank might be considering another Sicilian option, although at the back of their minds would be the drubbing that Anand received in game six. It was the sixth game which was a stunner for Anand. He was outdone in the opening itself and never recovered. Since then Carlsen has been in the thick of things as far as the opening preparation is concerned and has been calling the shots. Harbhajan Singh led from the front with an all-round effort as Punjab coasted to a comfortable 29-run win against Gujarat in the pre-quarterfinals of the Vijay Hazare One-day tournament here on Wednesday. Put in to bat, Punjab rode on fine fifties from Amitoze Singh (75), Gurkeerat Singh Mann (72) and Harbhajan (51 off 25 balls) to post a respectable 255 for eight in 50 overs. In reply, the Gujarat batsmen failed to capitalise on their starts as Punjab pace spearhead Sandeep Sharma, who bagged 3 wickets, helped bundle out the Parthiv Patel-led side for 226 in 47.3 overs. Harbahajn chipped in with 2/51. Punjab had looked in trouble when their opener Manan Vohra (6), No.3 Mandeep Singh (1) and two-down Yuvraj Singh (17) were dismissed. Amitoze and Gurkeerat then stitched a 104-run fourth-wicket partnership to put the innings back on track. After Gurkeerat and Amitoze were out, skipper Harbhajan, who came in to bat at No 6, took matters in his hands, and gave a much-needed boost to the total, hammering two boundaries and six sixes in his 26-ball knock. When Gujarat batted, Punjab had the game in control until their No. 9 Rohit Dahiya gave them a bit of a scare with his 60-ball 53, laced with 3 fours and 4 sixes. In the end, however, Punjab had an easy win. They will now face Railways in the quarterfinals. Aaron Finch hit his fifth One-day International century to drive the hosts to a 73-run victory over South Africa in Canberra on Wednesday and a 2-1 lead in the five-match series. Finch put on 118 for the first wicket with David Warner (53) and went on to score 109 on a good Manuka Oval wicket before being bowled by Proteas skipper AB de Villiers. Shane Watson hit a bright 40 but it fell to Steve Smith to haul Australia out of a mid-innings slump with a sparkling unbeaten 73 from 55 balls that gave Australia an imposing total of 329 for five. South Africa are rarely daunted by any target and openers Hashim Amla (102) and Quinton de Kock (47) started at a brisk pace at the ground where they will play Ireland in a group match at the World Cup next year. Their opening stand ended with 108 on the board when De Kock got a top edge to a Josh Hazlewood delivery that was caught by Mitch Marsh but Amla dug in as a couple of wickets fell at the other end to reach his 17th one-day century. By now he had been joined by De Villiers and their partnership looked like it might give the tourists a series lead going into the final two matches, in Melbourne on Friday and Sydney on Sunday. The match turned, however, when they were dismissed in successive overs, Amla clean-bowled by Hazlewood (3-51) and De Villiers trapped leg before by Kane Richardson for 52. Khalsa Warriors and United Singhs, who had finished the league phase as the top two teams, came through after contrasting wins in their semifinals. While the Warriors cruised through with a 70-60 win over Vancouver Lions, the Singhs came from behind to edge past California Eagles 63-58. In the first semifinal, the Warriors, who won a whopping 17 of their 21 league matches, led throughout the match. Led by Satnam Singh and Gurpreet Singh, the Warriors made seven stops in the opening quarter to open up a 20-12 lead. The Lions made a valiant attempt in second and third quarters, but the Warriors, egged on by the crowd, kept their foot on the pedal and completed an easy win. Raider Manjot Singh Gill (19 points) of the Warriors was adjudged the best player, while his teammate Satnam Sattu (6 stops) was the best stopper. In the second semifinal, United Singhs fell behind 18-14 after the first quarter. The Singhs made a strong comeback and at halftime the scores were level at 31-31. With the momentum on their side, the Singhs pulled away in the final two sessions to set up the title clash with the Warriors. Lovepreet Singh Sangha (21 raids) of the Singhs was named the man of the match. Courtesy strikes from Stiven Mendoza Valencia (62nd minute), Bruno Pelissari (70th min) and India international Jeje Lalpeklhua (90th min), Chennayin moved right on top of the table with 16 points. The Abhishek Bachchan and Mahendra Singh Dhoni co-owned team is on top having scored more goals than Atletico, who are on second position, with the same number of points. For Pune, it was an unfortunate own goal by Chennaiyin’s Cameroonian mideo Eric Djemba Djemba, that had given them some hope before the final burst from the ‘Blues’ buried them. Former world No. 4 Rusedeski, who arrived in New Delhi just hours before the opening tie and was beaten 6-1 by Juan Carlos Ferrero, has gone back in double quick time. Paes will play the legends’ singles, the men’s doubles with Somdev Devvarman and the mixed doubles with Garbine Muguruza. This is the second time Marshalls may feel ‘ditched’ after David Ferrer backed out of the league at last minute citing an injury. Interestingly, hours after the Spaniard turned his back on the league, his name was up there as the first reserve player in the ATP World Tour Finals. And three days later, he was playing at the season-ending event in London after Milos Raonic withdrew due an injury. Other than the ‘injury’ woes, the organisers have a lot more to worry about. Despite the many big names playing in the tournament, crowds have chosen to give a miss to the matches. Belated attempts to give away tickets for free too have not borne fruit. Wads of tickets were seen on the table in the team hotel. The inexplicable scheduling is to blame as the play continues well past 11pm in cold weather conditions. The tournament as such is not about winning or losing, it is an attempt to kick-start a league where the profile of tennis gets a boost. “It’s a unique format, men and women coming together. 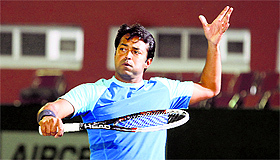 For me it’s about friendship,” Paes had said earlier. The owners of Punjab Marshalls have decided to make the entry free for the spectators for all their home matches to be held at the CLTA complex in Sector 10. The Marshalls will play Mumbai Tennis Masters at 8pm on Nov 20 and take on Delhi Dreamers at 5pm on Nov 21. World Boxing: Pinki, Monica crash out: On a thoroughly disappointing day for the Indian boxers at the World Women’s Championships, Commonwealth Games bronze-medallist Pinki Rani (51kg) and Monica Saun (75kg) crashed out after losing their respective bouts here on Wednesday. Pinki, the youngster from Haryana, found the going tough against her Russian rival Saiana Sagataeva. In a draining battle, Pinki lost steam much earlier than expected and was visibly slow in her movements after being knocked down once by Sagataeva in the second round. Monica, however, bowed out without putting much of a fight against China’s Li Qian. Trouble in offing for MCA, VCA and PCA: Three powerful associations of the BCCI who conduct Tests regularly — Mumbai, Vidarbha and Punjab — are likely to face the heat from the ruling group of the Board in the wake of the Supreme Court-appointed Justice Mudgal Committee giving a clean chit to N Srinivasan in the IPL 6 corruption probe. “There were talks at the Board’s Working Committee that Mumbai Cricket Association, PCA and VCA should be fined to get back the legal expenses incurred by the Board in fighting the case, now that Srinivasan has been given a clean chit,” said a source, who attended the BCCI WC meet in Chennai yesterday. Asked why these associations have been singled out, the source said that it has been found out by the others that some top administrators — current and former — connected to these three associations were supporting Aditya Verma, representing the unrecognised Cricket Association of Bihar. Kiwis pushing Pakistan hard in second Test: New Zealand bowled with discipline and, despite Azhar Ali and Younis Khan’s half-centuries, looked set for a lead in the second Test against Pakistan in Dubai on Wednesday. Pakistan lost Asad Shafiq in seamer Tim Southee’s penultimate over for 44 to close the third day on 281-6, still trailing by 122 runs on New Zealand’s first innings total of 403. Sarfraz Ahmed was unbeaten on 28 and Yasir Shah on one in a day when the Pakistani batsmen failed to score big after getting good starts. Leg-spinner Ish Sodhi led the New Zealand bowling with 2-65. Brief scores: New Zealand 403; Pakistan 281 for 6 (Azhar 75, Younis 72). Saina, Srikanth and Sindhu move into second round: Kidambi Srikanth continued his giant-killing spree while Saina Nehwal hardly broke a sweat to advance to the pre-quarterfinals of the $350,000 Hong Kong Super Series here today. Srikanth, who had stunned Lin Dan in the China Open final last week, shocked seventh seed Chou Tien Chen of Chinese Taipei 18-21 22-20 21-16 in his campaign opener. In the women's draw, Saina needed just 27 minute to beat unseeded Jamie Subandhi of USA 21-17 21-11. PV Sindhu also started her campaign on a winning note, beating Thailand's Busanan Ongbumrungpan 21-15 16-21 21-19 in 52 minutes.